The song was slow, and Linnetta found it positively mournful. Her partner seemed to be concentrating on the music as well, dancing ever more lightly to make up for her slow pace and dulled movements. “Do you really believe that your family is cursed, Linnetta?” he asked suddenly. “It’s good to know that someone thinks so,” she said. 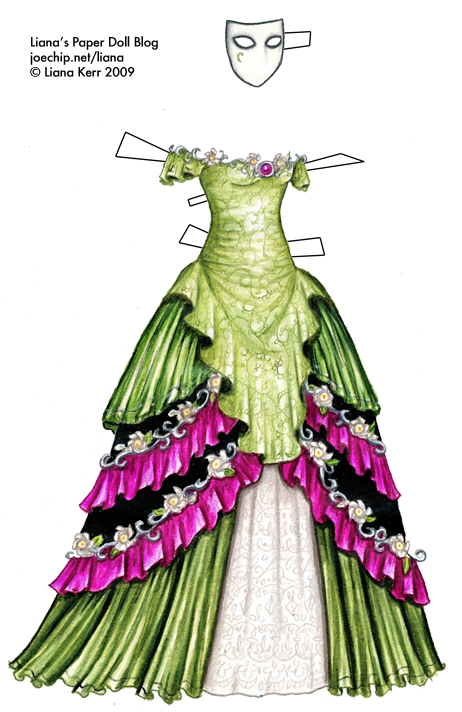 Off to the side, Linnetta could see a woman in a sickly green gown whispering to the another woman, the previous arrival in spangled black. Those two together made her uneasy. Undoubtedly they were watching her, but then again so was everyone else. She would have felt elated at all the attention, if not for those women. I love love love this dress! It’s incredible how far you have come as an artist! I would love some fairy clothes…..
Well, then again, how could I choose? I love the design of this dress. The detail of the embroidery is beautiful. The darker green reminds me of butterfly wings for some reason. I finally figured out what I like about this dress. It’s the colors. Not many people would think of putting green and pink and black together, but you did and you pulled it off wonderfully. The style, I like too, although something about the cut of the bodice bothers me (the embroidery is stunning, by the way) but I still love it. This is probably my favorite masquerade gown so far. Love it! I adore this one. The combination of colors is just spectacular.